Featured! Rooster Juce Home | About Us | Opportunities | Sponsorships | Contact Us! This week on Handmade Men we’re chatting with Darren and Rachel from Rooster Juce. This amazing line of men’s handmade and small batch grooming gear comes with style, clean ingredients, amazing scent, and presentation that can’t be beat. From shaving gel and shampoo to perfectly scented soaps and colognes, Rooster Juce creates the perfect products for guys who want an amazing alternative to the ‘same old, same old’. Enjoy! We are a husband and wife run small business located in Roseville, California. We established our company at the beginning of 2012. 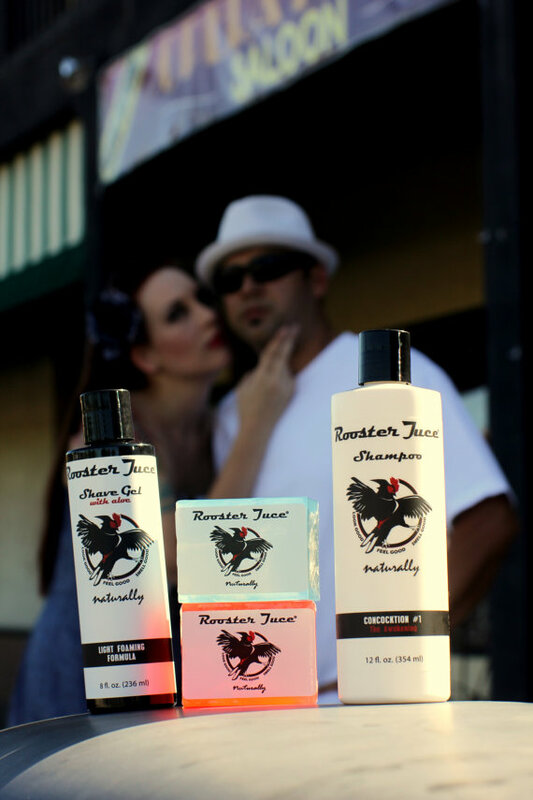 Rooster Juce products are for men who want to look good, feel good, and smell good naturally! Our goal is to offer you natural products that are mild, moisturizing, and refreshing. The Rooster Juce style and line is truly unique. What got you started on this journey and how did it all come together? It all started with an odd dream on my birthday last year! In the dream I was in a Mexican food restaurant looking up at one of those velvet wall hangings. The image was of a lady carrying a basket of tortillas and roosters scattering. The title of that picture was Rooster Juce. I got up that next morning and knew I had to do something with the name. That same day I bought the domain name and started the branding process. After brainstorming many ideas I finally decided to create something I could use myself, a natural men’s product line. Our light foaming Shave Gel with aloe is scented with a sweet manly musk. It’s not only refreshing and soothing but moisturizing as it promotes a close comfortable shave. The Rooster Juce Awakening Shampoo is sulfate-free and paraben-free. Scented with Italian Blood Orange fragrance it is extremely lively and refreshing. 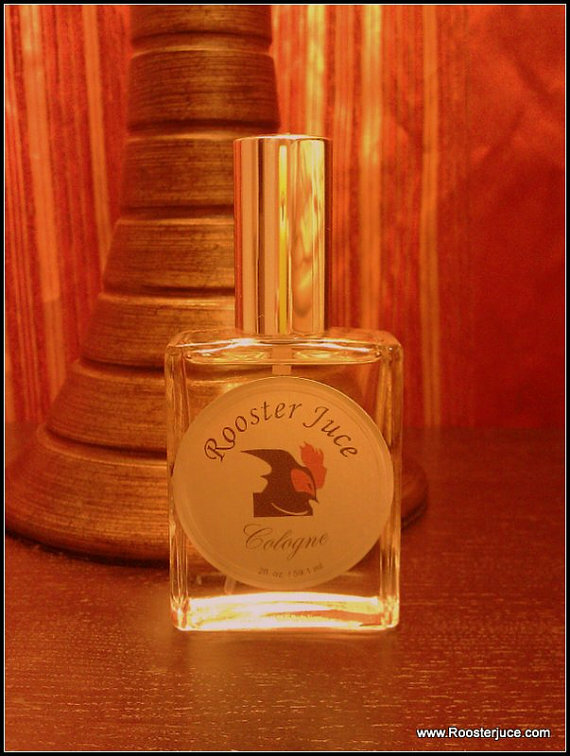 The Rooster Juce Cologne is our newest item and we are really proud of it! Sticking with our standards of mild and refreshing we gave the Cologne a sweet yet manly musk scent. The mildness of this Cologne allows you complete control so you don’t over funk yourself! Why do you think handmade, artisan, and small-batch men’s grooming products are such a great option for men right now? The key word is “option”. The guys need more natural grooming product options. I think men should use whatever works for them but they should also be aware that they don’t have to settle anymore. I created Rooster Juce with my needs and wants in mind because I couldn’t find what I was looking for in the market place. We just want to fill a void and be viable option for the fellas out there looking for something different. As an artisan, where do you feel that the handmade movement is heading? The future is wide open! With social media and sites like Handmade Men, Etsy, etc. artists and creators alike have a growing audience to display their talents. 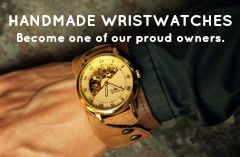 I believe handmade items will become popular and influential once again. Handmade is going to lose the price war against commercial products but as long as we stay true to ourselves and put out great products, people will find us, buy from us and spread the word! Thank you so much for taking time away from your busy shop to chat with us! 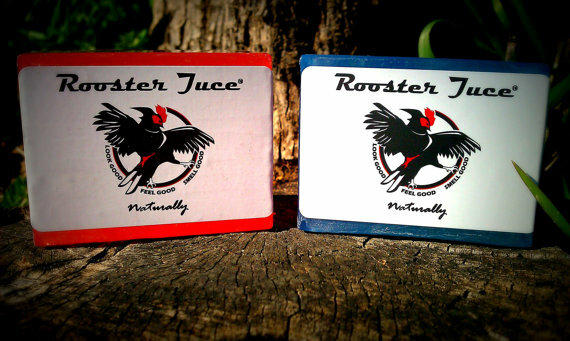 We’re huge fans of your work, and look forward to seeing where the Rooster Juce line goes! Tagged Cologne, Rooster Juce, Shampoo, Shaving Gel, Soap. Bookmark the permalink.